The Birth of an Ayn Rand Disciple. I was an avid fan of Ayn Rand for most of my life. I devoured her books, including Atlas Shrugged, Anthem, and her nonfiction essays. I thought Objectivism and its more popular cousin, Libertarianism, were the keys to every form of human progress and enlightenment. I despised all forms of government intervention. I was probably one late-night philosophizing binge session away from sliding into full-blown Anarchism. However, after spending the past decade researching all the available economic, social, and geopolitical data for my books, I now perceive Ayn Rand very differently. Objectivism is the Invisible Hand without Adam Smith’s Wisdom. At its core, Ayn Rand’s Objectivist philosophy of rational self-interest is simply a shallow derivative of Adam Smith’s Invisible Hand. However, Adam Smith wisely understood the limitations of rational self-interest as a governing philosophy, which is why he explicitly said that societies must implement reasonable regulations and taxes to preserve the stability and integrity of their economic and social ecosystems.1 In contrast, Ayn Rand ferociously rejected all forms of government intervention and welfare . . . until Ayn Rand needed government help during her vulnerable years. Ayn Rand’s Hypocrisy. My Libertarian and Objectivist friends usually prefer to ignore these inconvenient facts. 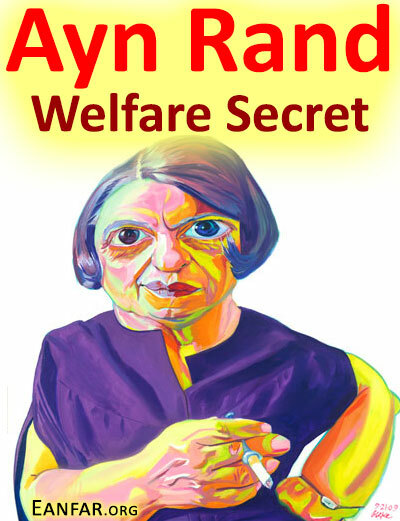 Sometimes they cite Rand’s comment that accepting government welfare is not hypocritical as long as one “regards it as restitution and opposes all forms of welfare statism.” This argument is nonsense because she would have accepted the government welfare regardless of how much she had previously paid into the system. The only reason she grudgingly accepted the assistance was because she needed it. If she didn’t need it, she certainly would have preferred to avoid taking any assistance at all from the government. Extreme Statism Inspired Ayn Rand’s Extreme Worldview. Ayn Rand developed her philosophy of Objectivism to justify and glorify human greed in reaction to the extreme collectivism that she experienced in Soviet Russia after the Communist Revolution, which she observed first-hand in 1917 when she was 12 years old. She was also likely reacting to Aldous Huxley’s book, A Brave New World (published 25 years before Atlas Shrugged), which depicted a dark dystopian society controlled by an evil super-state. George Orwell’s Animal Farm and 1984 were also published in the 1940s shortly after Stalin’s bloody bourgeoisie purges in the late 1930s, just before the outbreak of World War II. This was the violent, liberty-killing world of two rapidly rising forms of statism—Fascism and Communism—in which Ayn Rand developed her extreme worldview and philosophy. Thank Ayn Rand for “Greed Is Good”. Objectivism has never been taken seriously by the academic establishment for various reasons. Being shunned by the establishment would not matter to me if Objectivism was manifestly beneficial for humanity, but it is not. Objectivism only became popular with Libertarians over the past few decades because it gave corporate raiders and their worshipers a convenient intellectual facade to justify their greed and gluttony (“Greed is good.”). This facade gave birth to the god of shareholder value and the neoliberal economic philosophy that has spawned deregulatory and corporate welfare bonanzas during every U.S. administration since the 1980s. Shallow Logic, Over-Exaggeration, and Straw-Man Arguments. “I got the idea in my school days, in Soviet Russia, when I heard all the vicious attacks on individualism, and asked myself what the world would be like if men lost the word ‘I’,” said Ayn Rand about her book, Anthem.3 As an adult today, I now see that Rand’s books are filled with many over-exaggerated threats and irrational straw-man arguments. For example, no modern society will ever lose the word “I” just like no modern society will ever knowingly tolerate gulags, gas chambers, and dissident purges. These human atrocities do not occur because society wants them; they occur because economic conditions become so bad that self-serving politicians rise to power and gradually take the government away from the people. Objectivism does nothing to stop that threat; in fact, it accelerates the slide into tyranny because it inevitably leads to corporatism, which is the pre-cursor to Fascism. Humans Don’t Need Permission to Be Selfish. It’s difficult to find a principle in sociology more obvious than the principle that “humans are self-centered,” but Ayn Rand somehow concluded that humans are not selfish enough. So, she gave humans permission to be what they already are. For many young and independent-minded people, this “permission” naturally feels good at the individual level, but it’s a disaster for every society because it spawns corporatism, political and institutional corruption, cultural fragmentation, and countless Tragedy of the Commons problems. Ayn Rand’s permission to be selfish simply amplifies Homo sapiens’ most self-destructive animal instincts. Any short-term benefits that might occasionally come from her conception of pure rational self-interest are lost multiple times over by all the long-term adverse consequences. A Religion of Self-Interest. Ayn Rand’s disciples (including many famous names in business and politics) substantially ignore the societal and systemic consequences of their actions because Rand gave them permission to be self-indulgent animals and to preach her religion of self-interest. Their actions predictably result in unnecessarily intense economic crashes, economic imperialism, endless wars, industry monopolies, obscene income and wealth imbalances, political dysfunction, destruction of the Middle Class, systemically corrupt and dysfunctional institutions that are now grossly unprepared to deal with the consequences of Artificial Intelligence, and degradation of social cohesion, which magnifies ethnic and racial tensions in response to all the other problems. Running from Statism to Proto-Statist Corporatism. Ayn Rand’s fear of extreme statism in the 20th Century has given us extreme corporatism in the 21st Century. Corporations cannot grow into gargantuan Transnational Cannibals without the corporate welfare and government support of regulations and tax policies that are systemically engineered to favor the largest corporations. This systemic support can only be provided by a government that has already amassed too much power over a society’s resources, which is why it can divert those resources to the corporations. This process leads to a convergence of state and corporate interests and power, which manifests as statism. Thus, corporatism is a pre-cursor to statism along the path to Fascism. A Graveyard of the Human Spirit. Even before I became aware of her government welfare hypocrisy, my perception of Ayn Rand changed dramatically as I analyzed the real-world consequences of the economic policies that have been inspired by her philosophy. Rather than glorifying her as a paragon of reason and objective virtue, I now see that she was a deeply flawed, narcissistic, economically ignorant, ideologically-blinded, and hypocritical human with virtually no meaningful regard for the health and integrity of her society or her fellow humans. Now, in a world where Artificial Intelligence is already smarter than 1 million Einsteins and more creative than 1 million da Vincis, Ayn Rand’s fictional community of Galt’s Gulch is a shallow graveyard of the human spirit, not an elite oasis of liberty and prosperity. Objectivism Has Become a Catastrophe for Humanity. Based on her public statements, books, and essays, it appears Ayn Rand could see our world only through the fractured prism of her own self-interest, but she projected the distorted blacklight of her mind onto our world as if it was universal truth. Her greatest personal tragedy was caused by her own intellectual rigidity: She rejected empirical proof that smoking causes cancer, until she became terminally ill with lung cancer and dependent upon the government to pay her medical bills. That kind of intellectual rigidity and hypocrisy is at the heart of Objectivism. And it is this inability to see the real world and gracefully respond to human suffering that makes her philosophy so catastrophic for humanity today. 1. Many people don’t realize that Adam Smith was one of the first people to publicly write about the dangers of allowing too much power to concentrate into corporations. This is why I included many quotes from Adam Smith and an entire section called “The Real Adam Smith” in my book. 2. Of course, I’m not saying we should ignore any country’s incremental slide toward statism, but Objectivism creates more problems than it solves. Objectivism is the philosophical equivalent of dropping a nuclear bomb to hit a target when all you need is a laser-guided missile. And yes, I know the Federal Reserve continuously destroys the value of our currency like every central bank today, many types of taxes are disgusting in every country, various forms of government welfare are wasted in every country, state and corporate censorship is real, U.S. federal power has grown beyond its constitutional limits, etc. I’ve written about many of these issues in my books and articles. These are all common problems that you see in virtually every major country throughout human history for reasons beyond the scope of this article. As infuriating as those problems are, they’re nothing compared to the conditions in Stalinist Russia, which means there is no rational justification to be infected by Ayn Rand’s delusional paranoia, yet. 3. Berliner, Michael S., Andy Bernstein, Harry Binswanger, Tore Boeckmann, Jeff Britting, Onkar Ghate, Lindsay Joseph, et al. Essays on Ayn Rand’s Anthem. Edited by Robert Mayhew. F First Edition edition. Lanham, Md: Lexington Books, 2005.